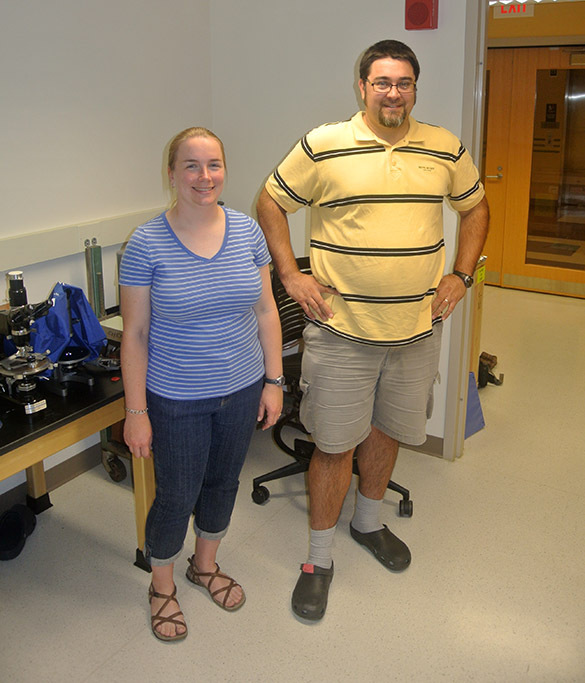 This week’s fossil is a celebration of classes beginning again at Wooster, and a memory of excellent summer fieldwork. It isn’t especially attractive, but it has paleontological significance. 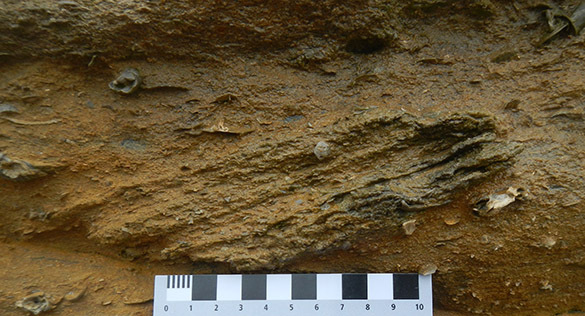 We are looking at a broken surface through a thick oyster from the Passage Beds Member of the Coralline Oolite Formation (Upper Jurassic, Oxfordian) exposed on the north side of Filey Brigg, North Yorkshire, England. 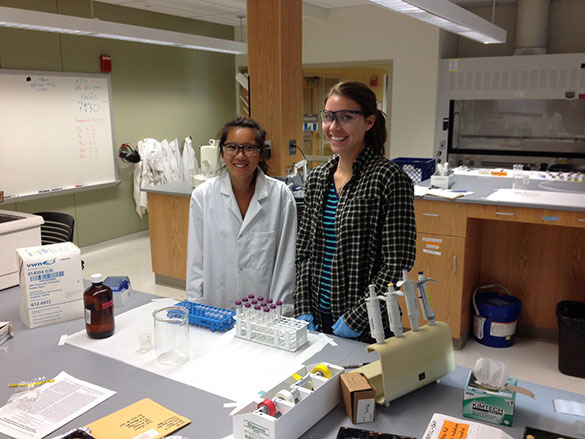 It was collected by Meredith Mann (’16) as part of her Senior Independent Study research in June. 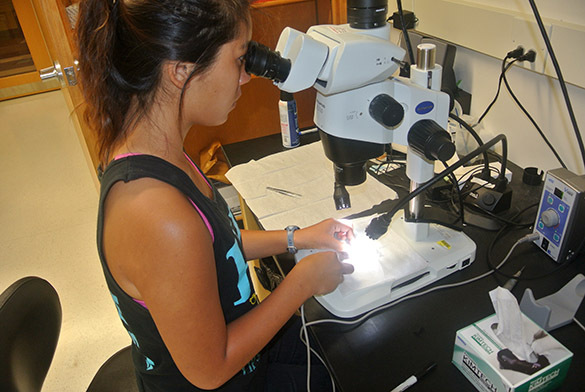 One of her project goals is to assess the sclerobionts (encrusters and borers) that lived on and within hard substrates in this interval. This thick shell is a start. 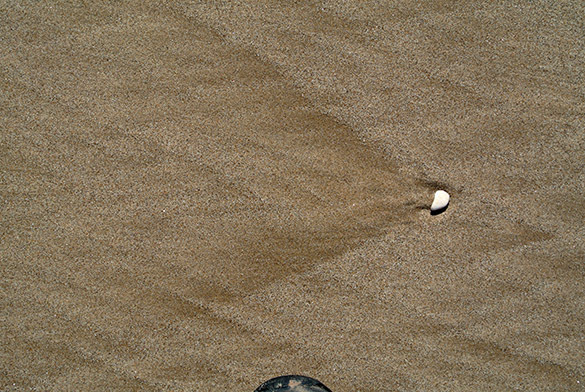 In this closer view we can see three rounded objects penetrating the oyster shell. 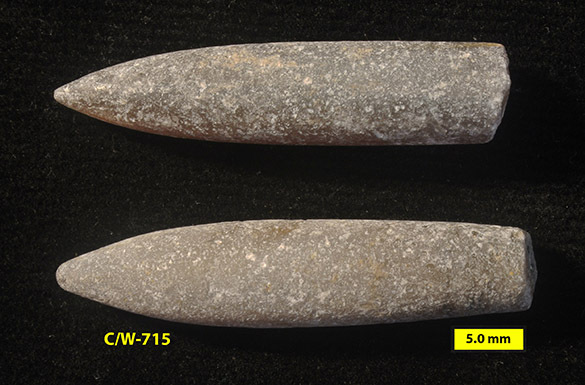 These are bivalve borings called Gastrochaenolites. They were open holes excavated by drilling bivalves that were later filled with sediment and cement. The outer surface of the oyster shell is covered with encrusting oysters and serpulid worm tubes. 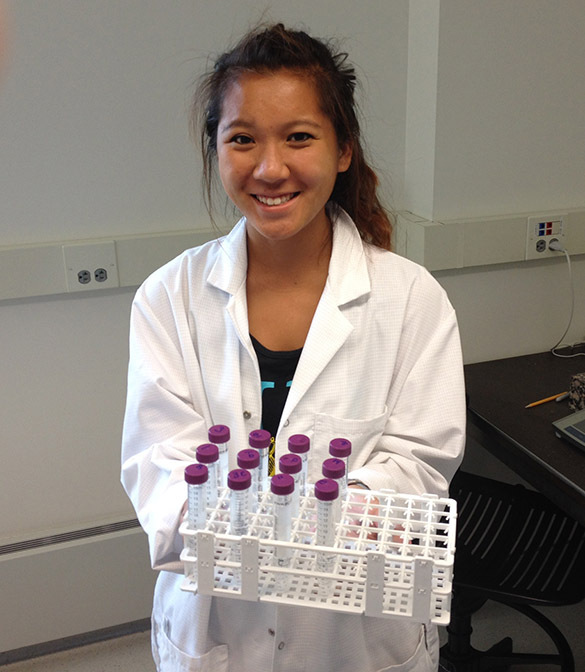 These will be more visible later after Meredith prepares the specimens. The first thing she is likely to do is use some bleach to remove the modern marine algae. 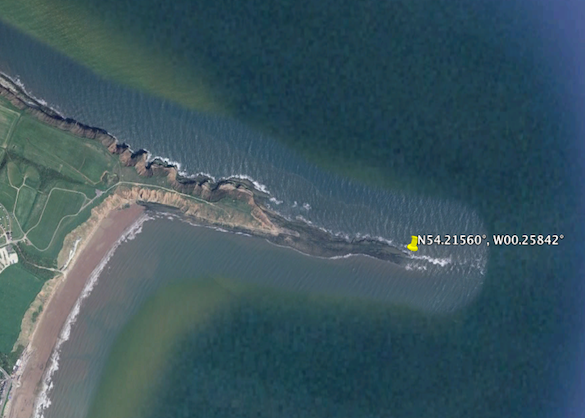 Our specimens were all collected near the high-water tide level on the rocky north coast of Filey Brigg (N54.21823°, W00.26904°). Meredith is here standing against the Passage Beds Member on June 14, 2015. 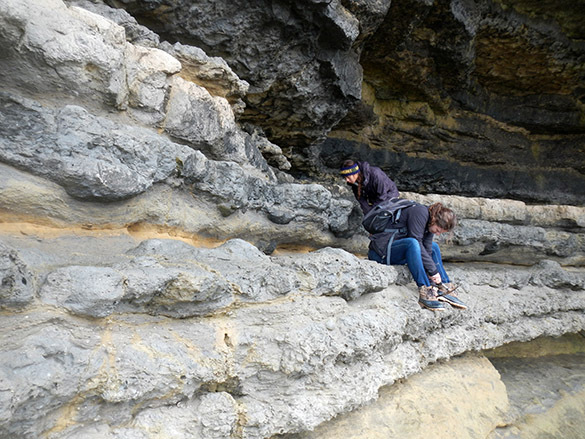 Her feet are on the top of the underlying Saintoft Member of the Lower Calcareous Grit Formation. 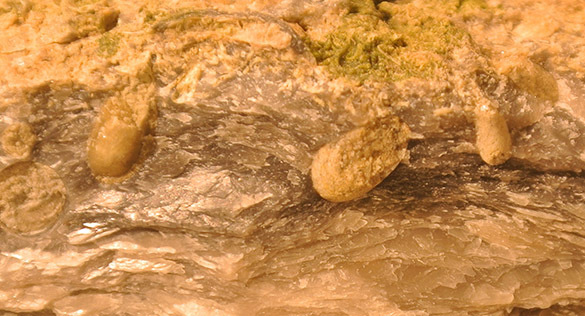 About a meter and a half above her head is the base of the overlying Hambleton Oolite Member (Lower Leaf) of the Coralline Oolite Formation. As we took this photo the sea was pounding behind us on a rising tide. 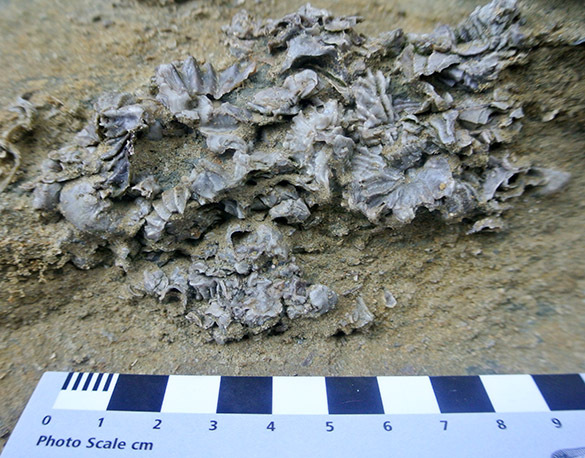 Here is a cluster of oysters preserved in the lowest unit of the Passage Beds. It is a sandstone distinct from the overlying limestones. 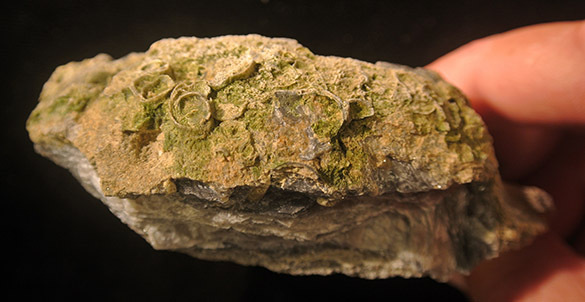 There is much evidence of high-energy transportation of shelly material. 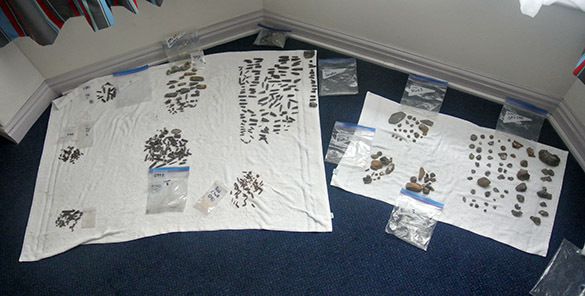 Here are Meredith’s specimens from this site, all cleaned and in stratigraphic order. 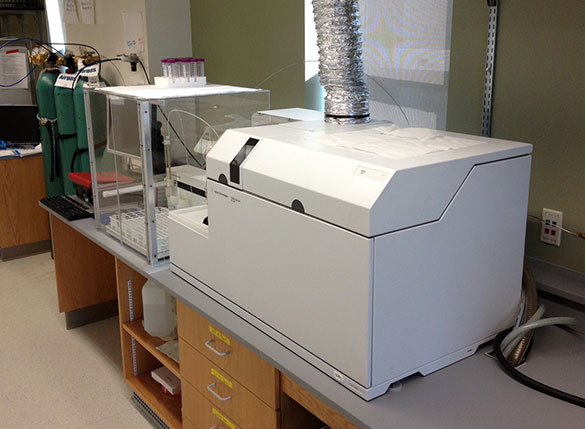 A critical part of her work will be a petrographic analysis of the Passage Beds Member. We hope to show you these thin-sections next month. 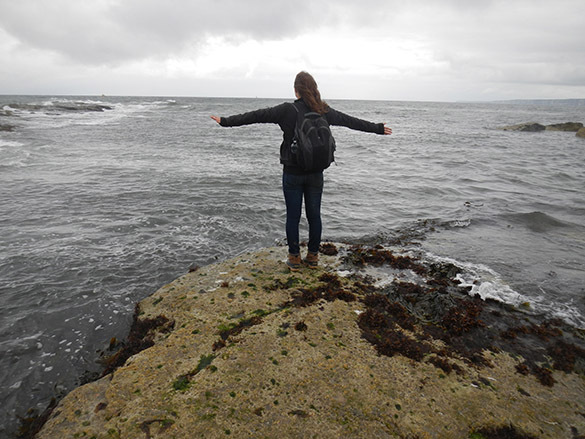 Meredith celebrating the end of her fieldwork as she confronts the rising sea on the tip of Filey Brigg (N54.21560°, W00.25842°). 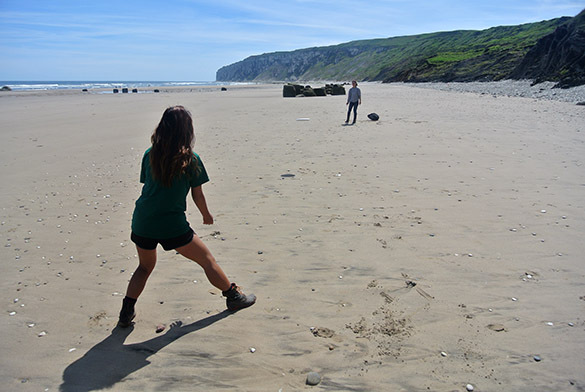 Mae Kemsley (’16) found this little beauty during her Independent Study fieldwork last month on the Speeton Cliffs of North Yorkshire. It is Meyeria ornata (Phillips, 1829), a decapod of the lobster variety, from the Speeton Clay. It is relatively common in Bed C4, so much so that it is referred to as “the shrimp bed”. Mae is the only one of our team of four who found one, though, so it is special to us. The above is a lateral view, with the head to the left and abdomen on the top of this small concretion. Here is a dorsal view looking down on the abdominal segments. According to Simpson and Middleton (1985), Meyeria ornata actively crawled about on the muddy substrate like modern lobsters. They did not have true chelae (large claws), so they were likely scavengers in the top layers of the sediment rather than predators. Charbonnier, S., Audo, D., Barriel, V., Garassino, A., Schweigert, G. and Simpson, M. 2015. Phylogeny of fossil and extant glypheid and litogastrid lobsters (Crustacea, Decapoda) as revealed by morphological characters. Cladistics 31: 231-249. M’Coy F. 1849. 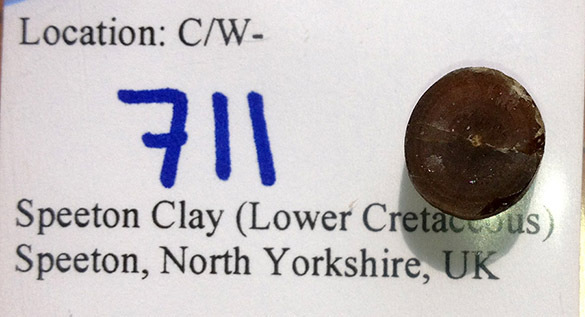 On the classification of some British fossil Crustacea with notices of new forms in the University Collection at Cambridge. Annals and Magazine of Natural History, series 2, 4, 161-179. Phillips, J. 1829. Illustrations of the geology of Yorkshire, Part 1. 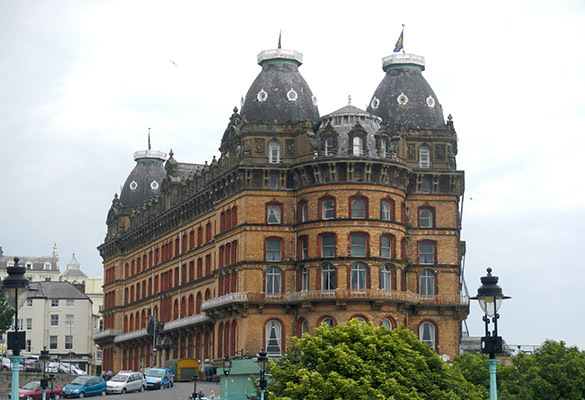 The Yorkshire coast: John Murray, London, 184 p.
Simpson, M.I. and Middleton, R. 1985. 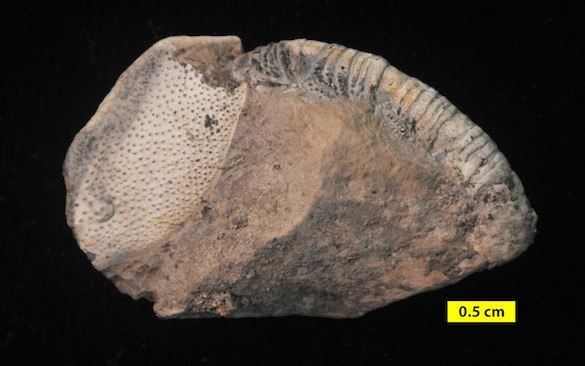 Gross morphology and the mode of life of two species of lobster from the Lower Cretaceous of England: Meyeria ornata (Phillips) and Meyerella magna (M’Coy). Transactions of the Royal Society of Edinburgh: Earth Sciences 76: 203-215. On the rails heading north. Way north. 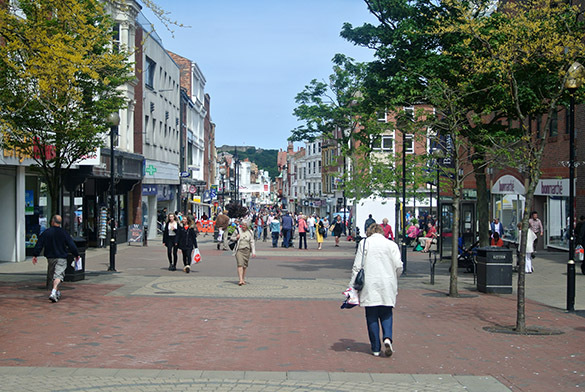 SCARBOROUGH, ENGLAND (June 17) — It is my turn to leave Scarborough. 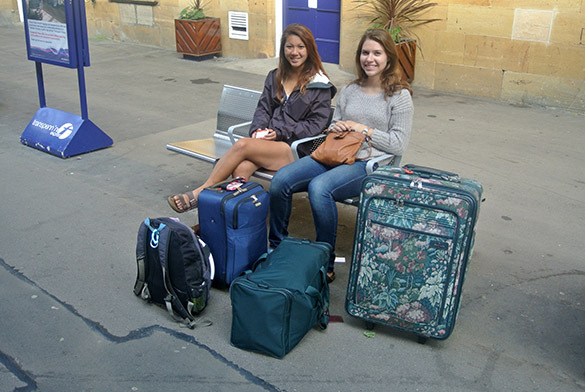 Mae and Meredith went south to London and then on to Paris yesterday. I’m heading north today into Scotland for a Larwood Symposium (run by the International Bryozoology Association) in Thurso and later Stromness. 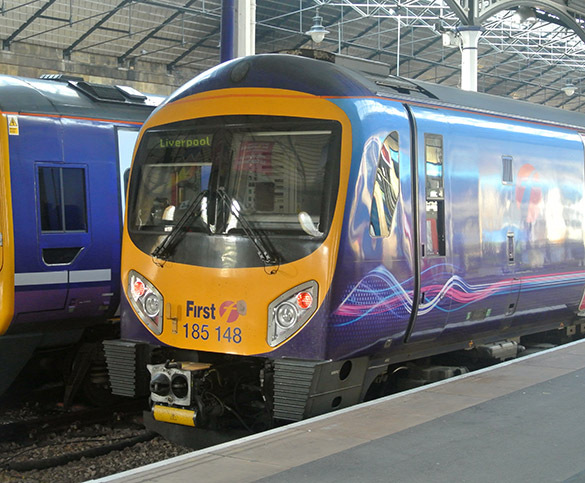 The trip is nearly 12 hours long by train, with connections in York, Edinburgh, and Inverness. I’m getting good use out of my BritRail Pass. I hope to see much through my windows as we cross through Lowland Scotland into the Highlands and eventually the north coast. 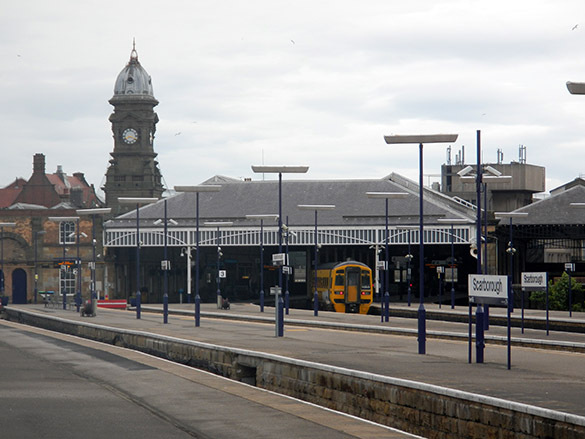 Thurso is the most northerly station in the British rail system. 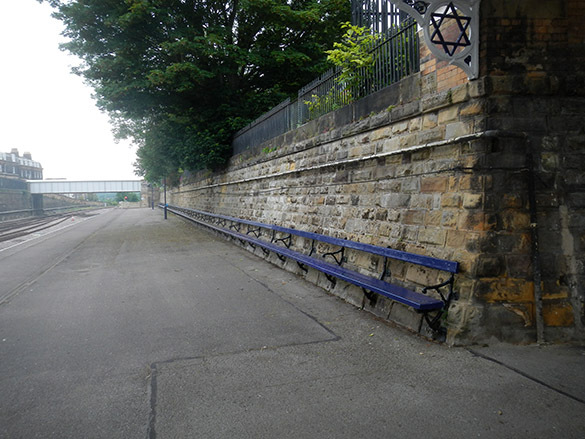 Did you know the world’s longest bench is in the Scarborough Rail Station? 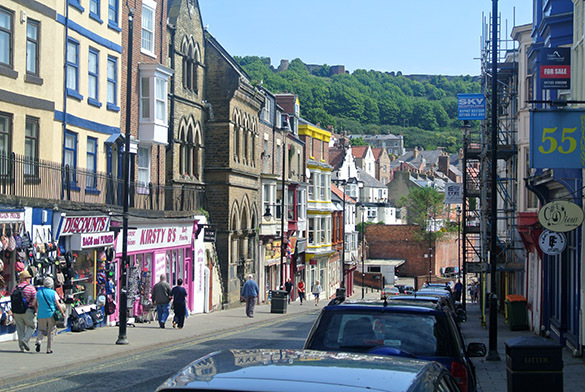 SCARBOROUGH, ENGLAND (June 15, 2015) — It is difficult to believe that yesterday was so cold and wet. Today was beautiful on the Yorkshire Coast. 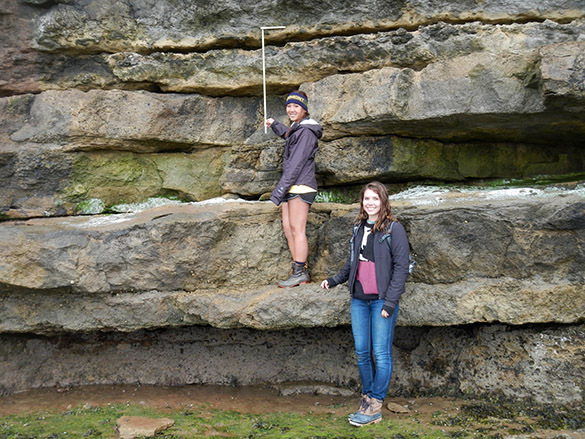 Mae Kemsley (’16), Meredith Mann (’16) and I traveled to Reighton Sands for one last look through Mae’s outcrops. 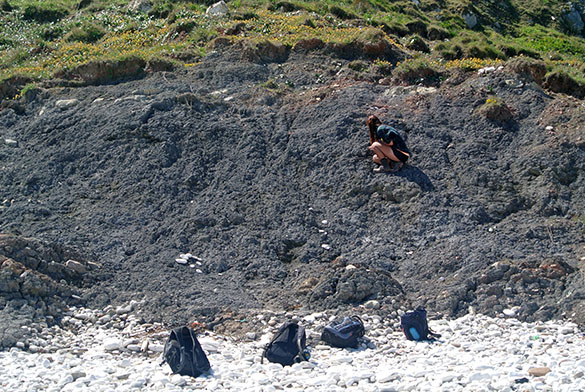 The tide was very low and the sunshine abundant, so we took lots of images and collected another bag of fossils. Above is the Speeton Clay (Lower Cretaceous). It rarely looks so good in photographs. A scene from our morning commute from Scarborough. 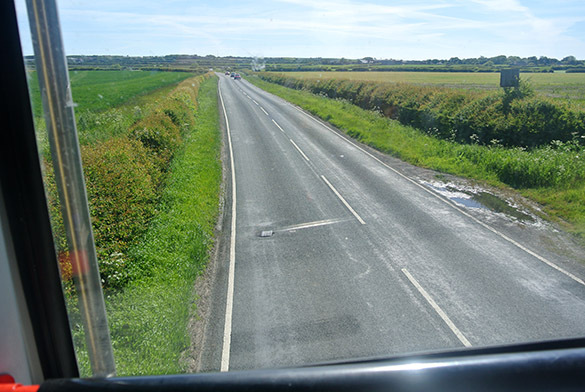 We like sitting in the top front of the double-decker bus. 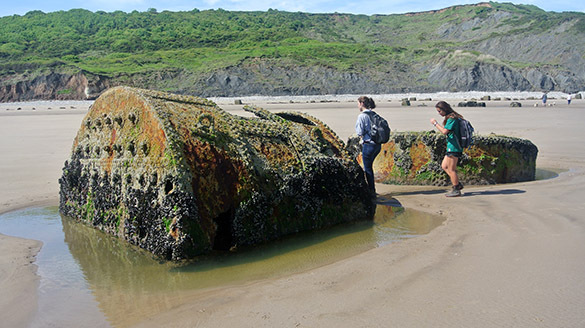 The tide was low enough to expose the pair of boilers from the SS Laura. You may recall this Austro-Hungarian cargo ship ran aground here on November 21, 1897. These heavy and resistant boilers have served as coastal landmarks for over a century. 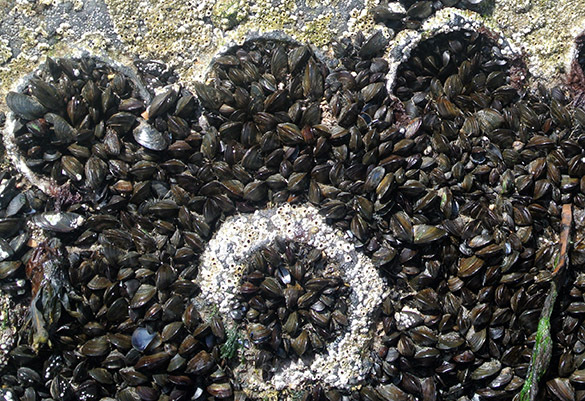 The SS Laura boilers are also a significant hard substrate for attaching mussels and barnacles. The white chalk cliffs of northern Flamborough Head were especially beautiful today. I wish there was a way to record the sounds of thousands of circling seabirds. 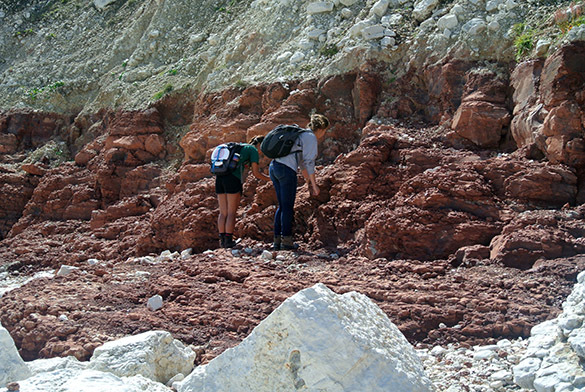 We visited an outcrop of the Red Chalk (Hunstanton Formation, Lower-Upper Cretaceous) one last tme to collect more belemnites for Mae’s future analytical work. We found quite a few Neohibolites, along with a coiled serpulid or two. Then it was back to the gray Speeton Clay. 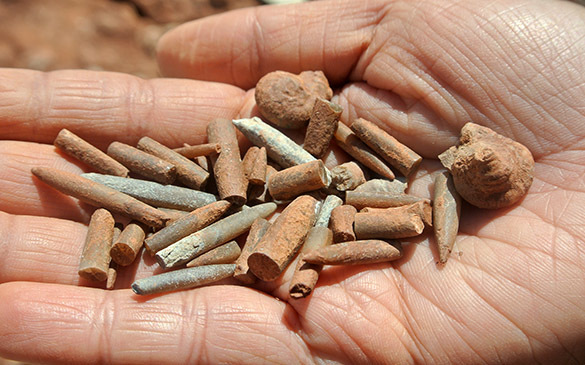 After yesterday’s rain, the belemnites seemed very easy to find. 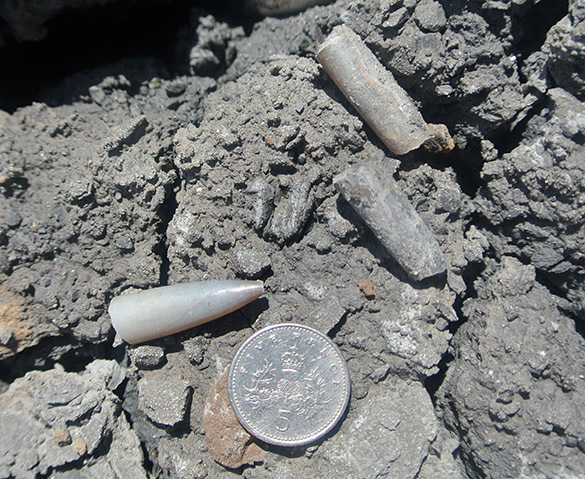 Today we were after belemnites that had borings and/or encrusters. Mae and Meredith took advantage of the beach to toss a frisbee around. 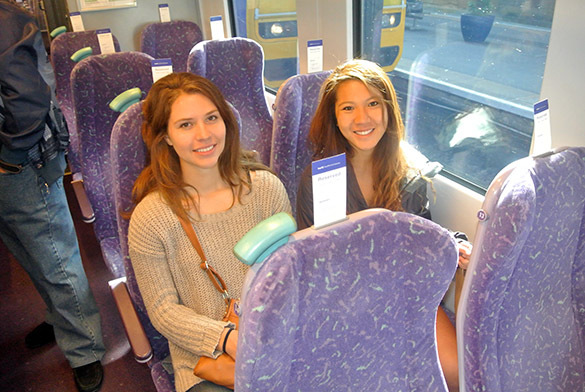 They are both members of Wooster’s superb Ultimate Frisbee team. We walked the long arc of Filey Bay to Filey. I was fascinated with the patterns in the sand left by the receding tide. 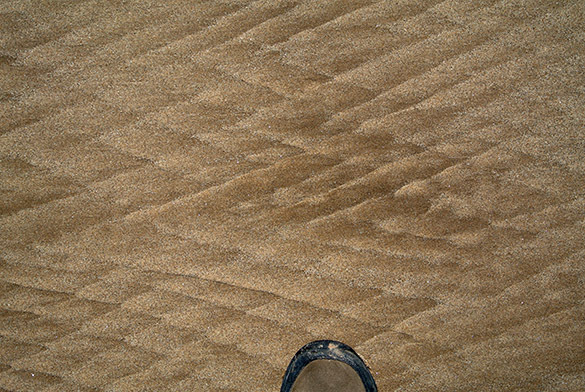 Those same sand patterns with a stone producing interference. 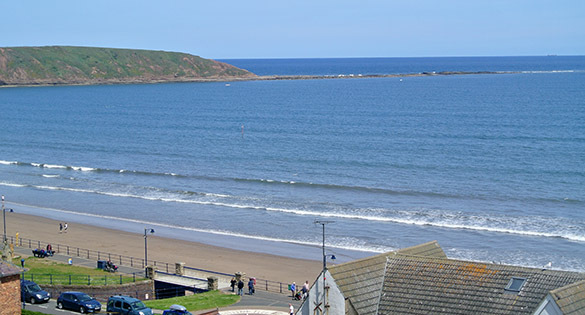 The seaside portion of Filey, viewed from the south. And finally a view of Filey Brigg from Filey. We were very pleased to have our last field day such a pleasant one. We hope we’ve prepared the way for future Wooster Independent Study projects in this beautiful part of the world. 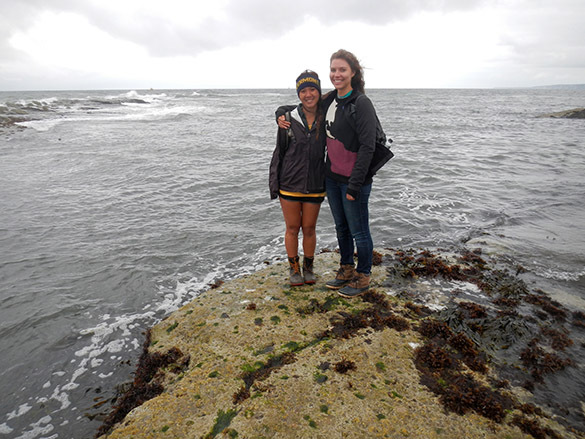 SCARBOROUGH, ENGLAND (June 14, 2015) — It was a drizzly, breezy, cold day on the outcrops, but Team Yorkshire finished measuring and collecting for Meredith Mann’s project on the Passage Beds Member of the Coralline Oolite Formation (Upper Jurassic, Oxfordian) exposed on the north side of Filey Brigg, a spit of rock between Scarborough and Filey. 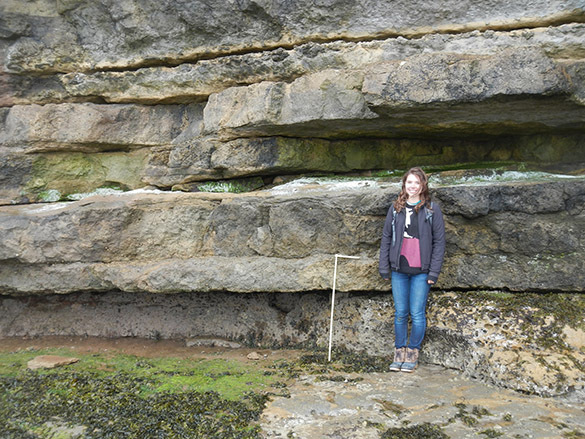 In the posed but useful image above, Meredith stands at the base of the Passage Beds, and Mae holds a meter stick pointing to the top, with the cross-bar on the Thalassinoides unit at the base of the Hambleton Oolite. We designated five subsidiary units within the Passage Beds, as shown above. 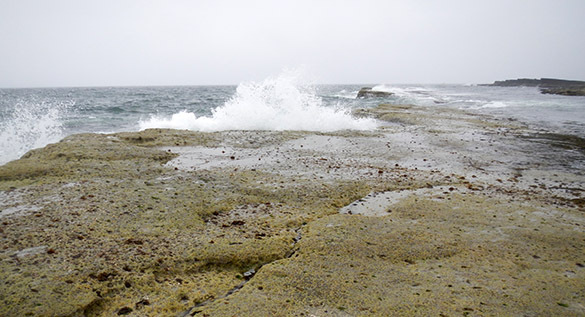 The rocks below belong to the Saintoft Member of the Lower Calcareous Grit Formation; the rocks above are the Hambleton Oolite (Lower Leaf) Member of the Coralline Oolite. Note how more ragged this exposure is because it directly faces the sea. The erosion better exposes the stratigraphy and fossils. It also means when we work here we are more subject to the elements. 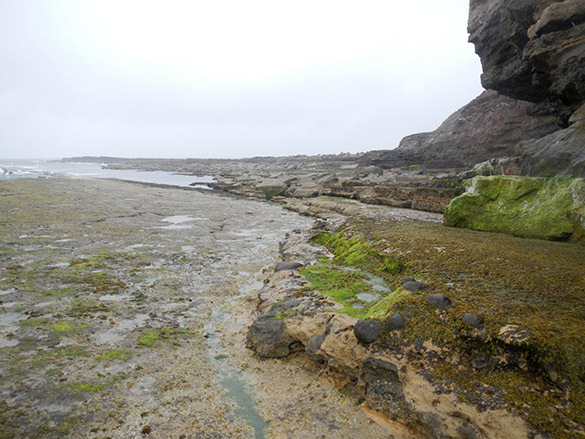 This location on the north side of Filey Brigg is only accessible at low tide across slick algal-encrusted rocks. The angry sea looms to the right. We have to climb over these boulders which are piled against a cliff face. 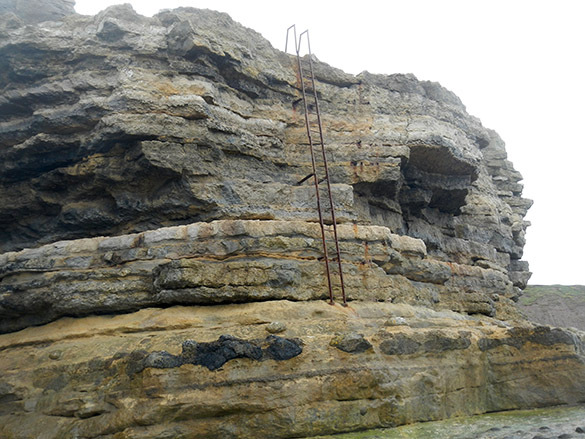 Since this area is flooded at high tide, if you wait too long to hike back the only escape from the raging North Sea is up this emergency ladder. I kept my eye on the ocean behind us! The remorseless sea pounding away at Filey Brigg during a rising tide. I hate rising tides. Meredith and Mae at work collecting rock samples and fossils. We are somewhat protected here from the rain by the overhanging Hambleton Oolite. The wind still blew in plenty of water from sea and sky. 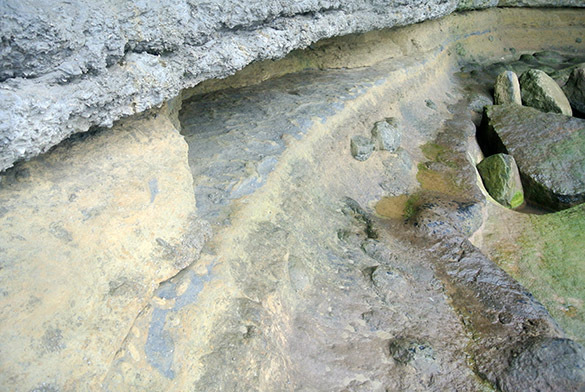 An alcove in Unit 1 of the Passage Beds with galleries of the trace fossil Thalassinoides. 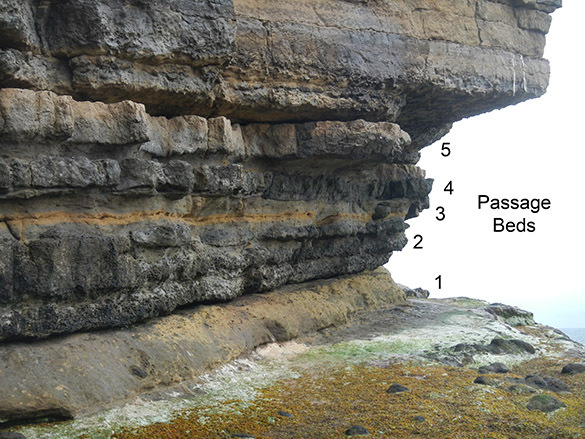 Unit 3 of the Passage Beds shows cross-bedding, which is consistent with its origin as sediments washed shoreward during storms. 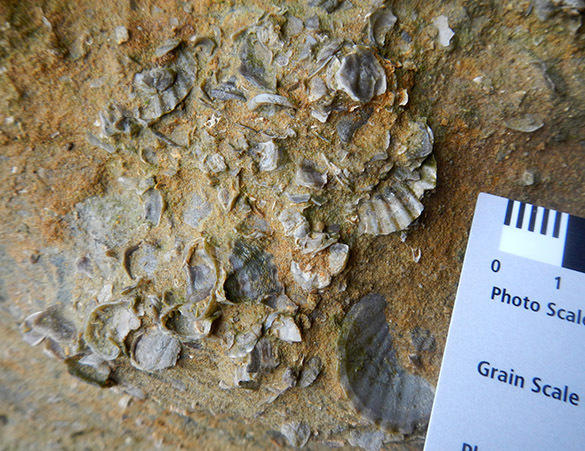 A cluster of oysters and pectinid bivalves in Unit 1 of the Passage Beds. 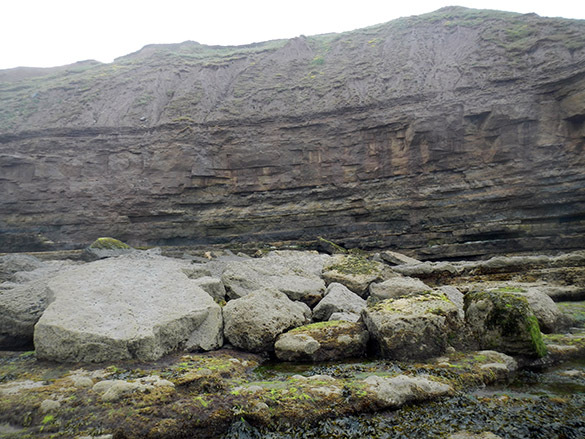 We celebrated completion of our fieldwork by walking as far out on Filey Brigg as we could! Miserable weather, but a dramatic setting! And no one broke a leg on the boulders or was trapped by the high tide. Rain delay in Yorkshire. Time for sample management. 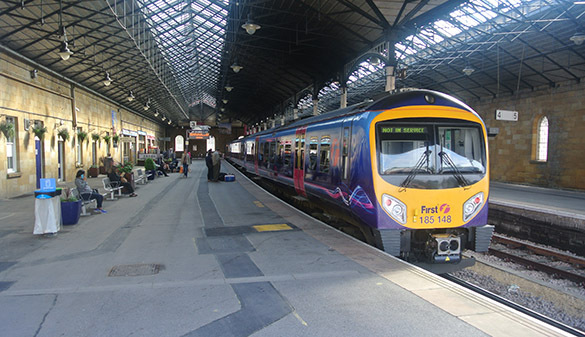 SCARBOROUGH, ENGLAND (June 13, 2015) — Our good fortune with the weather finally ended with a steady downpour this morning. Since it was during an advantageous tide, and I didn’t want us slipping around on wet intertidal boulders at Filey Brigg, we cancelled the day’s fieldwork. 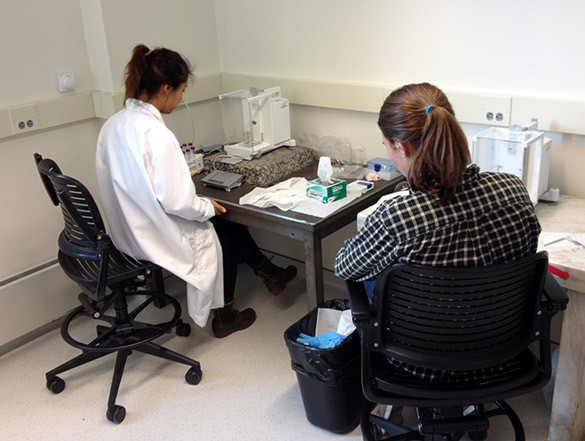 As generations of Wooster paleontologists know, this gives us time for Sample Management. We went through all that we collected, washed each fossil in my bathroom sink, and dried the lot on the hotel towels so kindly provided to us. It was the first time I got a good luck at many of the specimens the students collected, so it was rather fun. We then rebagged and labelled everything for the trip back home. Mae and Meredith have put together a nice collection for their studies. We have two more days of fieldwork to finish collecting for Meredith’s project. 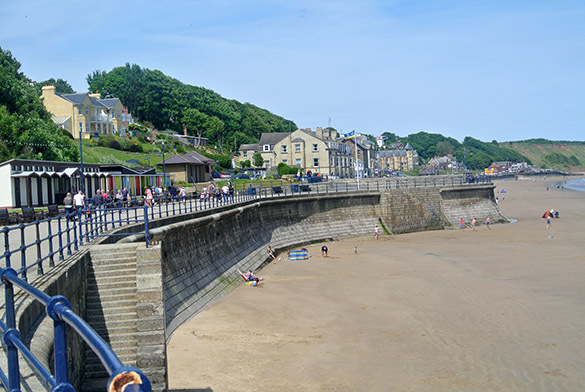 Most of our work as Team Yorkshire this month has been in Filey Bay on the northeastern coast of England. 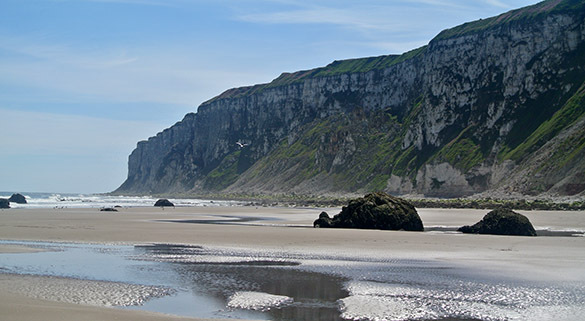 When we look south, as above, we see the northern extent of the famous Cretaceous chalk cliffs that extend far into the south of the country along the Channel coast. 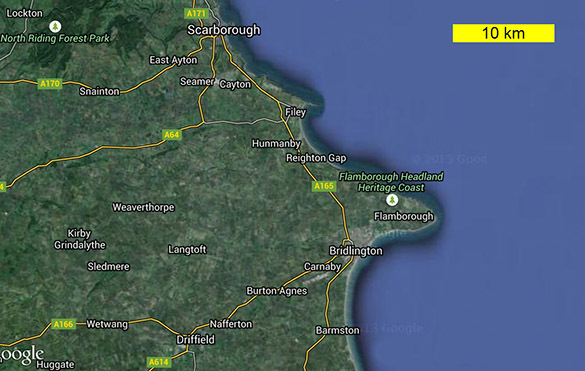 This point of chalk that we see jutting into the North Sea is Flamborough Head. If we were here on September 23, 1779, we would have seen here a dramatic naval battle between the Royal Navy and the earliest ships of the Revolutionary United States. 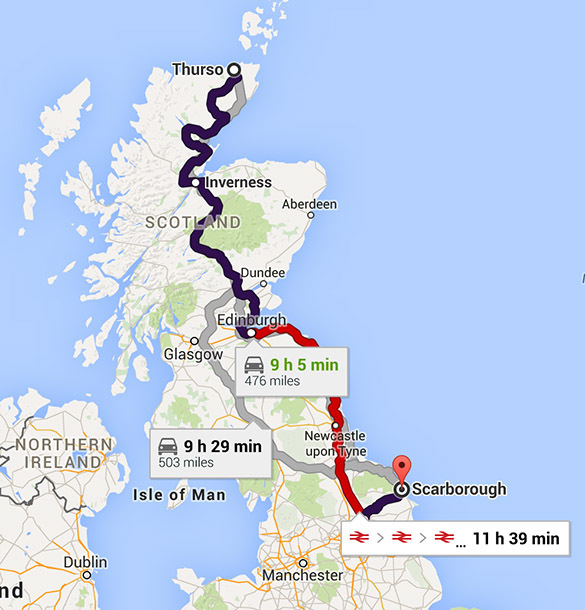 For orientation, you see Scarborough at the top of this Google map, and then Filey down the coast (with Filey Brigg visible as a thin finger of rock diving into the sea). 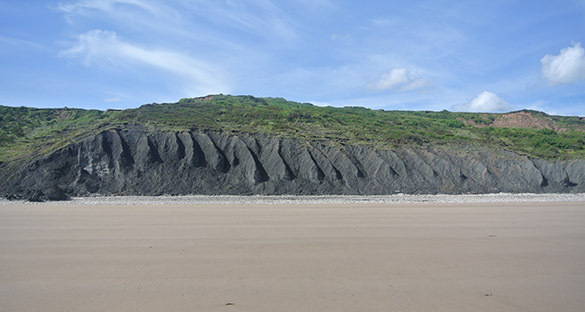 The top image was taken on the coast at Reighton Gap looking south. 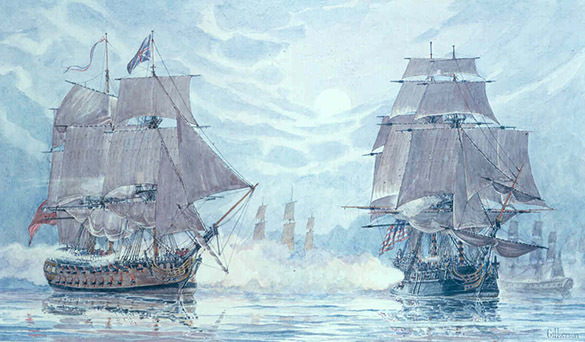 In these waters on that September day, Commodore John Paul Jones in the USS Bonhomme Richard (on the right) met Captain Richard Pearson of the HMS Serapis. The painting is by William Gilkerson and is displayed in the US Naval Academy Museum. 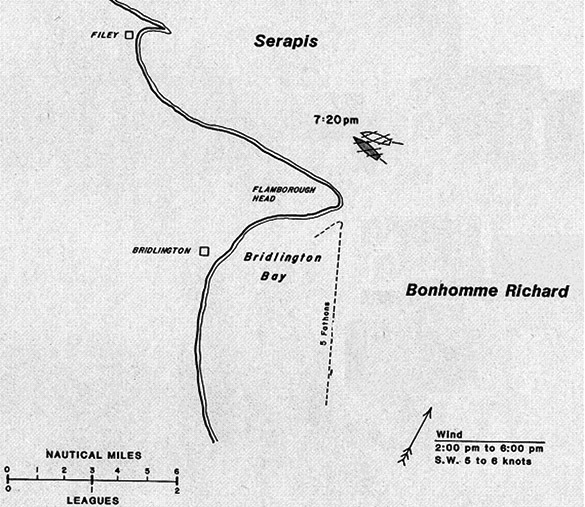 The battle was a complicated bit of seamanship on both sides, and both sides could claim victory. Overall, though, it was an astounding feat of American arms to have engaged the world’s largest and effective navy in its home waters. The story of the battle is best told by J. Scott Harmon on this website.